Hello! 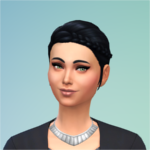 This is my attempt at the Drifter Challenge, created by the wonderful and talented Vihisha on the Sims 4 Forums! The Drifter Challenge is a set of mini-challenges or houses that you need to complete before you move on. You can pick and choose which houses you want to do or you can do all of them, which is what I’m doing! I’m also playing blind, which means that I’m going to focus on the house that I’m currently working on and I’m not going to look at the other houses and their challenges until I get to them. So let’s get started! We’re in for a wild ride! Chapter 1.5 - Where's The Table? Chapter 1.7 - Onward, My Friends! Chapter 2.3 - When Did He Get So Popular? Chapter 3.10 - What's Taking So Long? Last edited by mojot89 on January 17th, 2019, 11:26 am, edited 43 times in total. I started an undocumented drifter challenge and my founder also married Siobhan! My Siobhan also likes to spend a lot of time on her phone. Both kids are super cute and the house is coming along nicely! gretski6 wrote: Love the Swifts! I just started. Siobhan and Duncan (my founder) have their first child already. Are you going to post it? I'd love to keep up with your challenge! mojot89 wrote: Are you going to post it? I'd love to keep up with your challenge! I haven't taken any pictures, I'm not super far along but if I were to document it I'd like to be able to do it from the beginning. I might restart it but at the moment I'm doing a regular legacy and an ISBI so I want to focus on those first. But thank you for the support! The ISBI Is similar to the Drifter challenge in that you can only control the Torch Holder and everyone else is on autonomous. I'd say you are already well prepared for an ISBI. I'm excited to see what Elias gets up to! Yeah. I've definitely decided on starting one, now I just have to do it. Lol! Elias' start has been put on a short hold. Vi has stated that she's going to revamp the rules and stuff, so I'm waiting for her to do that before I get much farther with Elias. I know I'm going to have to move to a new save and I want to take his family with him so we keep the family ties. After a hiatus, we're back with more Swifts!! Re: A Swift Drift: A Drifter Challenge: Chap 2.3 *NEW* 2.08. Re: A Swift Drift: A Drifter Challenge: Chap 2.4 *NEW* 3.05. Re: A Swift Drift: A Drifter Challenge: Chap 2.5 *NEW* 6.07. Re: A Swift Drift: A Drifter Challenge: Chap 2.6 *NEW* 7.02. Re: A Swift Drift: A Drifter Challenge: Chap 2.7 *NEW* 7.22. Final post for House 2!